The 18th China (Shanghai) International Optics Fair is expected to enjoy a giant leap forward with a bigger number of participants. The annual event is scheduled to take place on 5- 7 March 2018 at the Shanghai World Expo Exhibition & Convention Centre. 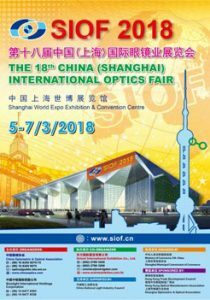 A large number of international exhibitors, together with their Chinese counterparts, will showcase the latest trends, products, and innovations of the optical industry here. The venue, located in the center of the 2010 Shanghai World Expo Site, is the primary choice for first class professional international events. Marchon, one of the world’s largest and reputed manufacturers and distributors of high-end optical frames and sunglasses. Marchon will showcase their renowned brands including Calvin Klein Collection, CK Calvin Klein, Calvin Klein Jeans, Karl Lagerfeld, Lacoste, Nike, Salvatore Ferragamo, and Valentino. Marchon’s headquarters is located in New York and also has offices in Amsterdam, Hong Kong, Tokyo, and Venice. Through all these channels Marchon is now admirably serving a clientele base exceeding 80,000 in over 100 countries. Another international eyewear manufacturer, Marcolin, continue to join SIOF. Marcolin is one of the biggest eyewear brands owners nowadays, their headquarter is located in Italy with over 288 distributors in 127 countries and region in the world. This year, Marcolin will showcase their renowned brands including Balenciaga, Diesel, DSquared2, Ermenegildo Zegna, Guess, Montblanc, Roberto Cavalli, Swarovski, Tod’s and Tom Ford. The world-renowned designer brand participants who will join SIOF 2018 include 3.1 Phillip Lim, Boston Club, Bywp, DITA, Face A Face, Four Nines(999.9), Frank Custom, Hapter, Ic!Berlin, Kaleos Eyehunters, Lafont, Linda Farrow Gallery x MW, Lindberg, Lunor, Masunga, Matsuda, Markus-T, Maui Jim, Monoqool, Morel, Moscot, Must By Grafix, Mykita, Native Sons, ÖGA, Plus, Prodesign, Sheets, Steady, Strada Del Sole, Thom Browne, Tony Same, Undostrial, Victoria Beckham, Vycoz & etc. There are 57 Korean exhibitors, including members of the Korea Optical Industry Support Centre & Korea Optometric Association and individual Korean companies, to name but a few, Bando, CMA Global, GEO, LookOptics, Huvitz, Interojo, New Bio, World Trend. They altogether occupy over 1,000 sqm in SIOF 2018’s international hall. One thing that is worth mentioning is that the number of exhibitors from Germany is the second largest in SIOF 2018. Some of the major German brands participating include Bywp, Cotec, Flair, Lunor, Menrad, Markus-T, Optotech, Satisloh, Schneider. And the German exhibitors occupied over 500 sqm in SIOF 2018’s international hall. There is a specific area for the exhibitors showing eyewear production machinery and visual test equipment in the international hall. Many well-known international exhibitors will showcase their up-to-date machinery and equipment in that zone, some of the machinery brands include B & S, Buhler, Coburn, Cotec, MEI, Optotech, Satisloh, Schneider; optical software such as Lensware International & Ocuco, are also on display there. And there are equipment brands such as Briot, Canon, Contamac, C.S.O., Essilor, Grand Seiko, Huvitz, Lenser, Nidek, Norville Autoflow, Novar, Shin-Nippon, Takagi, Topcon, Tomey, Reichert, Righton, Potec, and Visionix. 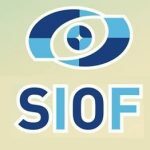 As for timing, SIOF takes place right after the Chinese New Year, which is the beginning of the buying season of the year and the preparation period for the summer months, hence global buyers rushing to SIOF 2018 could look for their targeted items easily.